Visiting Oxford recently for a friend’s significant birthday, we took a boat ride down the leisurely River Thames to where the waterway assumes the name of The Isis. 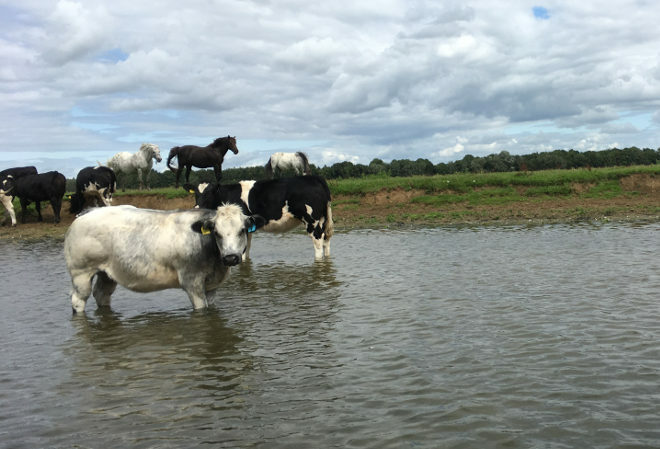 Away from the hoards of punts and hapless tourists, we reached Port Meadows, where cows and wild horses meander the banks and wade in the shallow water. It was remarkable to reach a space where nothing has changed for hundreds of years, In fact, its history stretches back to 2000BC. This is where Lewis Carroll rowed with Alice Liddell and told her stories of Alice in Wonderland, and where William Turner drank in the scenery while working on his early landscapes. Imagine a boat ride that carries its voyagers through time to encounter the people who once walked alongside here, or paddled through its water. What might they learn about their own time? If you write or create something prompted by this, please send an email to Judy(at)socket creative.com to let me know. With your permission, I might publish it on SkyLightRain.com.